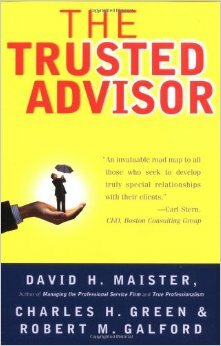 Some years ago we read this book, The Trusted Advisor, by David Maister, Charles Green & Robert Galford and it completely changed the way we viewed the pratice of law and the delivery of legal services to our clients. As we mentioned in a recent blog post here, many laymen look at lawyers as some kind of "high priests" who have the answers to arcane legal rules knowledge. Of course, there is a germ of truth in this view, but one problem it generates is that people don't call on lawyers until they have gotten themseleves into some kind of legal mess. This, of course is the wrong way to go. The to handle your legal problems is to go to your lawyer periodically, as you do your doctor, have a legal checkup and a long talk. Here at The Soni Law Frim that is exactly what we want you to do. Don't come to us when yor have received the letter or the summons, but way before. We work on and pride ourselveds on being Trusted Advisors who can give you a through check up and steer you clear of the legal problems you are bond to face in todays business world. So, give us a call and set up time for a check up.